easyJet celebrated the opening of its 29th base in Europe at Nantes Airport on 5th April, in attendance of VINCI Airports and the airport team. Nantes is a strategic choice for easyJet seventh base in France as it is both an attractive leisure and business destination with growing inbound and outbound demand. This base opening is aligned with easyJet strategy of long term investment in France where one quarter of all its passengers starts or finishes their journey. Operator of Nantes-Atlantique airport since the signing of the concession contract in 2011, VINCI Airports successfully rolled out its inclusive airport development model, in close cooperation with airlines and in particular with easyJet. VINCI Airports’ model focuses on the improvement of connectivity in the Nantes region benefitting the North West territory local communities; transformation of the customer experience and the roll out of a best in class sustainability policy. Johan Lundgren, easyJet CEO and François Bacchetta, easyJet country director France and Italy were joined by Nicolas Notebaert, CEO of VINCI Concessions, President of VINCI Airports and François Marie, Nantes-Atlantique airport Director to celebrate this important milestone in the airline’s expansion during a ceremony which was also attended by Laurent Dejoie, Regional Council Vice-President and Finances commission President and Jacques Gillaizeau Nantes Metropolis VP. The ceremony guests were able to see the landing of an Airbus A320Neo, flying from London, with its improved noise and carbon performance that comes with this new generation aircraft. easyJet is one of the major operators of the Airbus NEO in Europe. easyJet also unveiled a Nantes based aircraft with a special livery featuring Nantes’ iconic “Chateau des Ducs” that will help to promote the city across the 27 destinations easyJet flies to in Nantes. Since easyJet started flying to Nantes with a flight from Geneva in 2008, it has carried 6.5 million passengers to and from the airport. With the three new Airbus A320 aircraft based in Nantes, easyJet is able to offer a total of two million seats in 2019, an increase of 37% compared to 2018. easyJet will fly 100,000 new visitors to Nantes in 2019.
easyJet’s investment will provide clear benefits to the local economy with the creation of 110 local jobs for pilots and cabin crews along with many more being created in the wider local economy. This base means more choice with 14 new routes, more frequencies especially on domestic routes with a 30% increase, and improved schedule with more early departures that would benefit to our 20% of business passengers in Nantes. 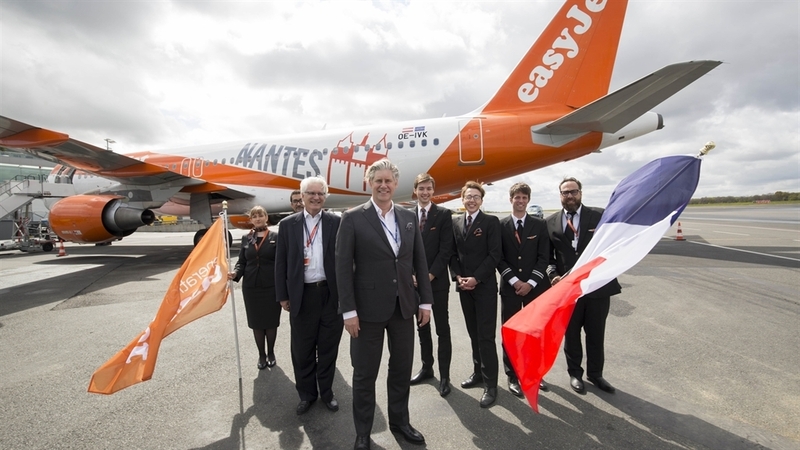 Johan Lundgren, easyJet CEO commented: “As we celebrate the launch of this new base in Nantes today, we are really proud to continue the airline’s successful expansion in France. Over 20 million passengers fly with us to and from France every year: that’s a quarter of all easyJet passengers which shows how important France is to the airline. This base opening is another significant milestone in France for easyJet, now counting seven bases across the national territory from today. “We remain committed to France and we have big plans for the new base as with three A320 based we are aiming to reach the #1 position in Nantes with 25% market shares, flying 1.8 million passengers this year. “Our investment in Nantes will provide clear benefits to the local economy in terms of jobs with 110 local jobs for pilots and cabin crew and thousands more being created in the wider local economy. easyJet will promote Nantes and its region across the 27 destinations we operate from Nantes and I am sure our customers will enjoy our great network and our fantastic crews. “This attractive and dynamic region has found in easyJet a long term partner for its future development”. François Bacchetta, easyJet’s France Director added: We have built a long term relationship with Nantes and have been working hand in hand with Nantes airport for over 10 years now to build a relevant leisure and business network reflecting our customers’ needs while continuously improving the customer experience. Nicolas Notebaert, CEO of VINCI Concessions, President of VINCI Airports said: “easyJet has chosen the Nantes-Atlantique airport as its first base in France’s North West region, and this is excellent news for the airport teams and all the stakeholders. As we have seen in Lisbon, Porto and elsewhere, selection as a base by a leader such as easyJet has a strong positive impact on a region. This is in keeping with the action we take at VINCI Airports to make mobility a development driver that creates jobs and enhances the region’s ability to attract tourists by opening new routes. Laurent Dejoie, Pays de la Loire Regional Council Vice-President added: “The opening of an easyJet base at Nantes-Atlantique shows the region attractivity and dynamism as economy and population are both growing. The 14 new routes easyJet is launching will contribute to the airport and the region influence in France and in Europe while supporting local employment. Jacques Gillaizeau Nantes Metropolis VP chimed in: easyJet base launch in Nantes is milestone in the airline long term development in French regions. It is a true satisfaction for Nantes and its metropolis as it acknowledged Nantes is gaining attractively at a European level. This is also good news for local employment with the creation of over 110 jobs. The three based Airbus A320 will also be the ambassadors of our local experience as parts of these aircraft family are manufactured in Bouguenais.